Advanced resin-modified glass ionomer formula offers enhanced marginal integrity with low solubility, high strength, and virtually no post-operative sensitivity. Provides sustained fluoride release. New light-cure formula permits faster and easier clean-up. Convenient automix delivery for dispensing directly into the restoration (no hand mixing). Contains: 1 x 8.5g (5ml) automix syringe, 12 automix tips, technique guide and instructions. Contains: 3 x 8.5g (5ml) automix syringes, 36 automix tips, technique guide and instructions. Mixing tips have a pink hub, clear barrel and white mixer. RelyX Luting Plus was evaluated by 32 consultants in 580 cases. It received a 96% clinical rating. 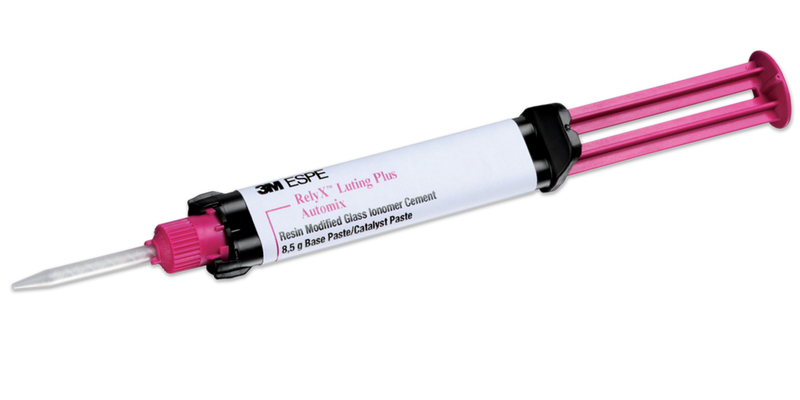 3M ESPE RelyX Luting Plus Automix is a radiopaque, fluoride-releasing, resin-modified glass ionomer luting cement. It is self-curing with an option for tack light curing of excess cement for ease of removal. It consists of base and catalyst pastes packaged in an automix syringe. It is available in a white shade. RelyX Luting Plus Automix is indicated for the permanent cementation of ceramic-metal (PFM) crowns and bridges; metal crowns, inlays and onlays; crowns made with alumina zirconia cores; posts; and orthodontic bands and appliances. It is also indicated for the cementation of PFM, metal, all-alumina and all-zirconia restorations on implant abutments. RelyX Luting Plus Automix has a working time of 1.5 minutes from start of mixing. It should be tack light cured for five seconds per surface. It selfcures to a gel-phase in two minutes with a full setting time of five minutes after placement in the mouth. RelyX Luting Plus Automix is an excellent cement for use with metal-, alumina- or zirconia-based restorations. The automix delivery is convenient and easy to use, providing a homogeneous mix every time. The consistency is creamy with a low viscosity that allows complete seating of the restoration with little pressure. The ability to tack cure the cement for quick clean-up of excess cement was a favorite feature of consultants. One color, white, is available. Some consultants expressed a desire for a more neutral shade for use under translucent all-zirconia crowns. RelyX Luting Plus was evaluated by 32 consultants in 580 uses. It received a 96% clinical rating.